Did you know that Hijrah.co has 2 After School Centres called, “Little Sahaabah After School Adventure Club?” that assists children with their school subjects & most importantly inculcating prophetic character and values in children through storytelling, guided reflection, hands on and outdoor activities while also working on their fine motor skills, teaching our very own Little Sahaabahs how to preserve the pure hearts they are born with, In Syaa Allah. 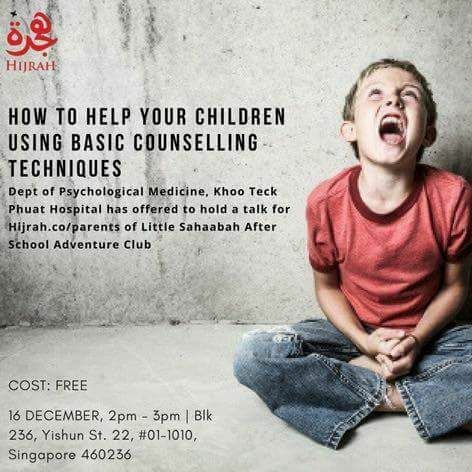 On 16 December 2017– Khoo Teck Puat Hospital Dept of Psychological Medicine, has offered to hold a talk for Hijrah.co, parents of Little Sahaabah After School Adventure Club. A talk we can all benefit together as we educate and discipline our children. Learn effective parenting skills that addresses social, emotional, and behavioral challenges.